Network Rail have published the Kent Route Study, which says the following about Charing Cross station. Charing Cross and Cannon Street stations are effectively full. Only Platform 1-3 can take the longest trains at Charing Cross station. The study suggests this as a solution at Charing Cross. are likely to be many issues with a project on this scale. 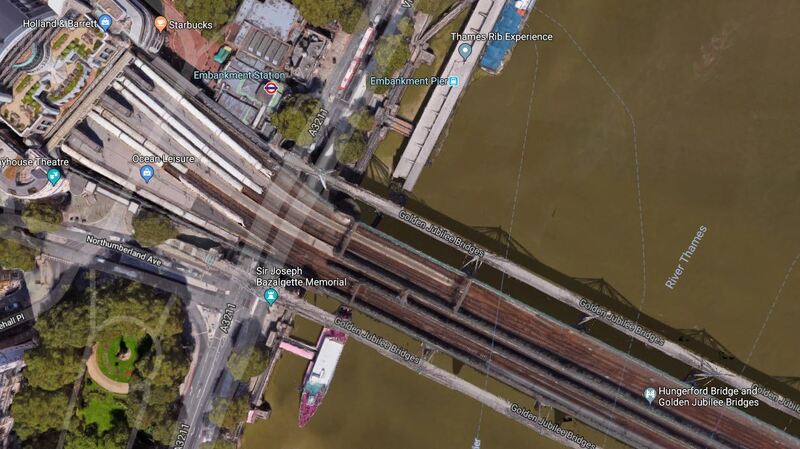 This Google Map shows the station and the Northern |end of the Hungerford Railway Bridge. Platforms are numbered 1 to 6 from top to bottom. The two Golden Jubilee footbridges on either side of the Hungerford bridge. There appear to be four or five tracks on the bridge. The bridge appears to tracks on either side of a central truss. I went to Charing Cross station on the train and then walked across the downstream Golden Jubilee Bridge, which is the top one in the Google Map. The Hungerford Bridge is certainly a good example of Victorian engineering, which appears to be two separate sections separated by a big truss, with trains running o either side. Network Rail obviously feel that it will be possible to create a cross-River station, as they have published the idea in the Kent Route Study. I shall outline some thoughts. Will The Hungerford Bridge Have To Be Replaced? Replacing the bridge and all the associated steel-work, would be an extensive and expendive project. The state of the bridge, which was refurbished about three decades ago, will be very important. Modern structural engineering can probably give the bridge sufficient integrity and possibly more space. The Golden Jubilee Footbridges, which are some of the busiest pedestrian crossings of the Thjames would obviously stay. I feel that unless the bridge was in a really poor condition, that the current bridge won’t be replaced, but it will probably be substantially rebuilt. Will Waterloo East Station Be Closed? The Kent Route Study said this about Waterloo East station. A double-ended Charing Cross station would give benefits similar to those at Blackfriars. A Southern entrance to Charing Cross station would possibly be better than Waterloo East station for entertainment on the South Bank. Passengers transferring between Charing Cross and Waterloo services might have further to walk. Cutting out the stop at Waterloo East would save time. It would probably make it easier to stick to the timetabe. Some of the Waterloo East site could be released for development. I wouldn’t be surprised to see Waterloo East station closed. How Many Trains Could Use Charing Cross Station? Currently, the six platforms at Charing Cross handle sixteen trains per hour (tph) in the Off Peak. A well-run platform can turnback four tph, so it could be that the capacity of a well-laid out Charing Cross station could be 24 tph. Other factors could increase the capacity of the station. The platforms could be long enough to handle two full length trains. Entrances on both sides of the river would ease passenger flows. The next generation of trains will hold more people in a train of a given length. Automatic Train Operation could be employed on trains out of Charing Cross. Obviously, the engineers and architects will have to get the design right, but I believe this frequency could be possible. I think expanding Charing Cross station across the river is a good plan and not impossible. But the design could be tricky! It also looks like the passenger capacity at Charing Cross could be substantially increased. Charing Cross [already] ran 24tph during the London Bridge works and is supposed to increase to 28tph once they are finished and they sort out the stopping pattern at LBG (which was the main bottleneck*). Cannon Street will only handle 22tph on 7 platforms, but only has two platforms and a shared one at LBG, and Blackfriars 20tph soon and 24tph once the signalling is sorted. * and now has three platforms and a shared one, but contra-tidally. Build a viaduct linking Waterloo East to a high level station within Waterloo, create a huge South Bank Crossrail combining all Waterloo and London Bridge lines, turn Cannon St and Charing Cross branches into high capacity people movers to London Bridge and Waterloo.